Welcome to Hair Unique. 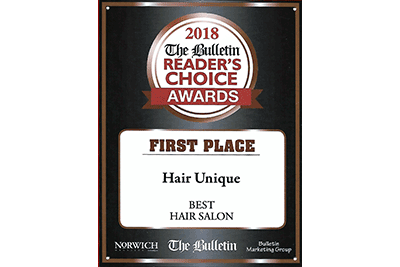 We are a full service hair salon that specializes in men’s and women’s haircuts, hair styling, hair coloring, corrective coloring, foiling, permanent waves, waxing, bridal styles, and up-dos. We believe that every one of our clients is unique and is deserving of our best. In order to make that commitment to you, our stylists continually receive advanced education in all aspects of hair design. We listen to our clients and make expert recommendations for their wants and needs. We are excited about what we can do for you. 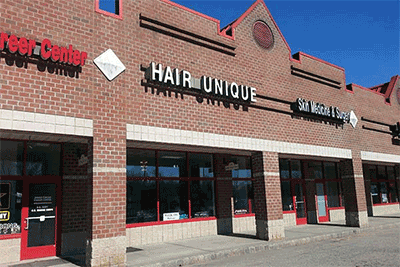 Hair Unique Salon is located at 77 Salem Turnpike Suite 106 Norwich CT 06360. We serve Norwich, Colchester, Montville and all surrounding areas. Thank you for visiting us online! We look forward to seeing you soon. My name is Lisa Courter. I am the owner and a stylist at Hair Unique. I am proud to say that hair has been my life for 35 years. As a day one stylist and manager it was a natural transition for me to become the new owner of the salon. I love my job because I get the opportunity to make every person that sits in my chair feel great about themselves. It is the most rewarding part about this career! I also love to attend as many classes I can about all aspects of this exciting industry. Come in and let me or any of our talented stylists help you feel and look your best! I joined the Hair Unique team in 2000. I love every aspect of being a stylist, from shampoo blow-dries, to color and highlights. There is never a dull moment in my chair! I have been a stylist for 20 years and I absolutely love a challenge! Coloring hair is my favorite part of the job. Come see me for a fresh new look. I am proud to be a member of the Hair Unique team. Coming to work is a pleasure and I am truly blessed with a wonderful and longtime clientele. I find it exciting when someone wants a new cut or color. I also love having a new client and creating a new look. I love all areas of hair styling. My focus is on you, always taking personal consideration. Face shape, proportion, color pattern, life style, and staying up to date on trends and techniques through education is my top priority. I am a stylist and former Hair Unique owner with over 30 years’ experience. I enjoy creating new looks for clients with haircuts and colors. I love making my clients feel good about themselves. Hello my name is Judi. I attended the New London Academy of Hairdressing graduating in 1985. I started out at Hair Unique that same year in July. My favorite part of the job is the great people that I get to meet and help with their hair needs. Come see me for your next haircut, color or perm. I look forward to getting to know you! I have been a receptionist at Hair Unique of 12 years and a client for 30! Please call and I will be happy to set up an appointment for you. I have worked at Hair Unique for 29 years. Hair Unique has been a wonderful place to work. Most of our team has worked together for many years. I love to do colors more than any other service. Colors change with the fashions and can be enhanced to match any style. I have been a receptionist at Hair Unique for 14 years, as well as a client for 28 years! I love the opportunity my job gives me to meet so many great people. As a young teen I always knew my passion, to be a hair stylist. After many careers I finally achieved my goal. I work at a great salon and I am always excited to interact with my clientele, making them beautiful whether it be color, cut and style or make-up. My reward is how beautiful they see themselves after their service. I believe that if you do what you love you never have to work a day in your life! I have over 14 years’ experience as a hair stylist at Hair Unique salon. I love the opportunity to make someone look and feel their best by either changing colors, adding highlights, or just giving a client a new haircut. I am passionate about my profession and truly feel blessed to be in a career that I love. 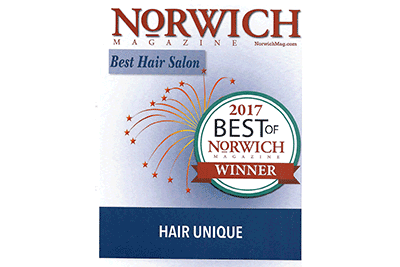 I have been a hairstylist for 40 years in the Norwich and Mystic areas. 30 of those years have been at Hair Unique Salon. I do most aspects of hair dressing but my forte has always been in precision hair cutting and styling. Come to see me on Wednesdays or Saturdays. Hair Jedi. Two things that are the most rewarding to me in the beauty industry are making people look and feel amazing about themselves. Whether it’s a great hair cut or a fabulous hair color makeover, I look forward to seeing you and using my skills to make you look and feel like a million bucks. My name is Natasha Smirnova. I have worked at Hair Unique as a Master Esthetician since 2002. I am originally from the Ukraine and moved to the United States in 2000 to Salt Lake City, Utah. My education combines European and American studies. I graduated from the Kiev Esthetician Institute and the Francois Academy in Salt Lake City. I have a high level of education and much experience. I love my profession because it allows me to make my “girls – clients” younger, healthier and happier. I have been a hair dresser for several years and enjoy all aspects of hairdressing including cutting, colors, perming and styling. I enjoy meeting new women, men and children of all ages. Let me create a special style just for you. EXPERIENCE THE DIFFERENCE – VISIT US TODAY!